Large disk galaxies like our own Milky Way were not always the well-ordered, pinwheel-like, spiral structures we see in the universe today. On the contrary, international experts who specialize in galaxy formation and evolution believe that about 8-to-10 billion years ago, progenitors of the Milky Way and similar disk/spiral galaxies were smaller and less organized, yet highly active in their youth. 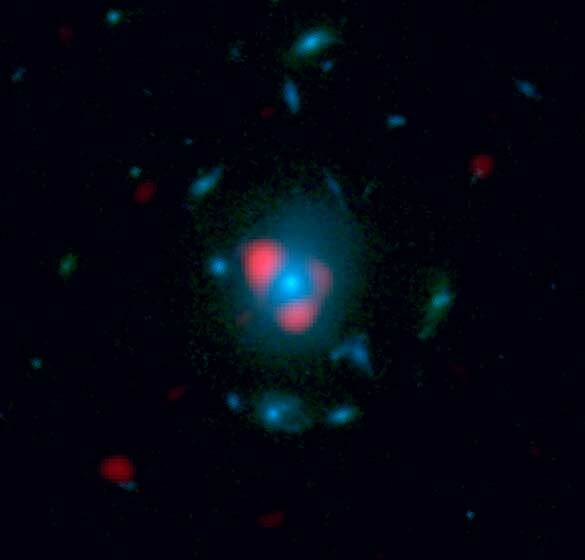 In previous NASA and National Science Foundation-funded research, Texas A&M University astronomer Casey Papovich and his collaborators showed that these younger versions of such galaxies were churning out new stars faster than at any other point in their lifespans, suggesting that they must be amazingly rich in star-forming material. And now, they have compelling evidence—the galactic equivalent of a smoking gun. Using the National Radio Astronomy Observatory’s Atacama Large Millimeter/submillimeter Array (ALMA)—a huge, highly sophisticated radio telescope array situated at 16,500 feet altitude in the high desert of Chile—a Papovich-led team of astronomers studied four very young versions of galaxies like the Milky Way that are 9 billion light-years distant, meaning the team could see them as they looked approximately 9 billion years ago. They discovered that each galaxy was incredibly rich in carbon monoxide—a well-known tracer of molecular gas, which is the fuel for star formation. Though the relative abundance of star-forming gas is extreme in these galaxies, Papovich says they are not yet fully formed and rather small compared to the Milky Way as we see it today. The new ALMA data indicate that the vast majority of the mass in these galaxies is in cold molecular gas rather than in stars—a situation that Papovich says is reversed at present in our Milky Way, where the mass in stars outweighs that in gas by a factor of 10 to 1. These observations, he notes, are helping build a complete picture of how matter in Milky-Way-size galaxies evolved and how our own galaxy formed. The presence of extensive gas reservoirs backs up the team’s previous observations that provided the first tangible pictures showcasing the unprecedented life story of Milky Way galaxy evolution. Among other details, their prior study revealed a stellar birth rate 30 times higher than it is in the Milky Way today—roughly one per year, compared to about 30 each year 9.5 billion years ago. “Thanks to ALMA and other innovative instruments that allow us to peer 9 billion years into the past to analyze galaxies that are likely similar to the progenitor of our own Milky Way galaxy, we can actually prove what our observations show,” Papovich said. “This will begin to tell us how these galaxies formed stars at such a rapid pace, compared to conditions at present,” he said. Papovich, Quadri and Tran are among roughly two dozen astronomers around the world who have spent years studying carefully selected distant galaxies similar in mass to the progenitor of our own Milky Way that were found in two deep-sky program surveys of the universe, the Cosmic Assembly Near-infrared Deep Extragalactic Legacy Survey (CANDELS) and the FourStar Galaxy Evolution Survey (ZFOURGE). Beyond ALMA, the team’s research has used observations from NASA’s Hubble and Spitzer Space Telescopes and the European Space Agency’s Herschel Space Observatory. 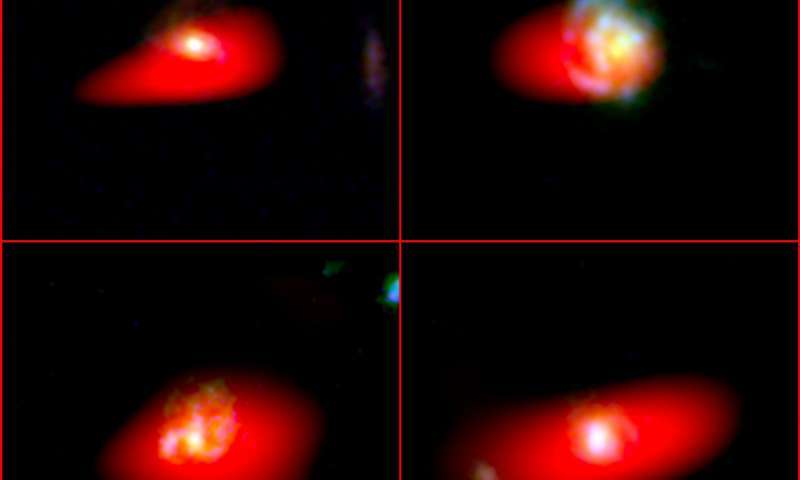 The Hubble images from the CANDELS survey also provided structural information about galaxy sizes and how they evolved. Far-infrared light observations from Spitzer and Herschel helped the astronomers trace the star-formation rate. The team’s paper, Large Molecular Gas Reservoirs in Ancestors of Milky Way-Mass Galaxies 9 Billion Years Ago, can be viewed online along with related images and captions.